SET will take place in the incredible city of Berlin in partnership with our friends at Tres Cabezas / 19 grams. In 2002 Robert Stock and Sascha Spittel founded Tres Cabezas, a specialty coffee brand, dedicated to superior quality, sustainability and direct connections to coffee farmers in originating countries. They opened the first Tres Cabezas café in one of the former rough Kiez of Berlin, Friedrichshain , at the Boxenhagener Strasse 74. In 2014 a new line of products was launched by Tres Cabezas under the name 19grams. Classes will begin at 9:00 and finish at 4:30 pm with an hour break for lunches, which will be provided. Be prepared to experience Cup of Excellence (COE). 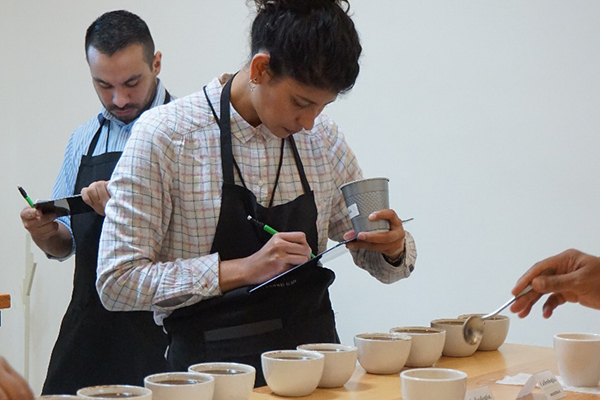 You’ll cup many different coffees, processes and cultivars, practice logistics and cupping protocol of a COE cupping and take an exam just like National Jury sensory professionals. This will show you how you are calibrated with the rest of the jury as well as your sensory confidence with samples that are representative score. The first two days we focus on COE cupping, the protocol of identifying qualities, identifying common flavor attributes, scoring and a common language. We then will advance to expose all participants to technical approach on our quality variables, different varietals and some common defects. Sessions include lab, lecture and active discussions. We will also provide coffees from other countries for you to taste and learn; processed naturals and honeys/pulped naturals & varieties, etc.